USA’s Maia Shibutani and Alex Shibutani perform their Short Dance at the 2016 Four Continents Figure Skating Championships. 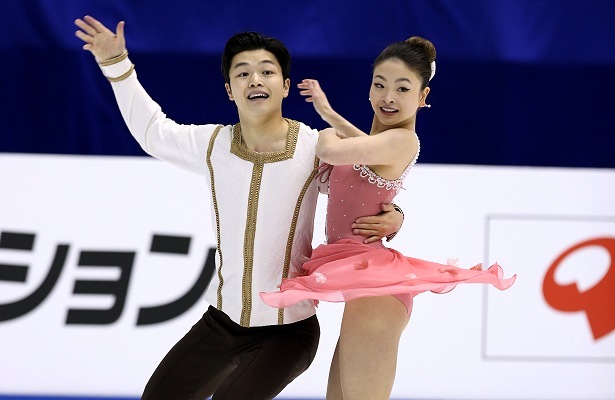 U.S. ice dancers Maia and Alex Shibutani won their first major international title when they danced off with the gold medal at the 2015 ISU Four Continents Figure Skating Championships Friday in Taipei, Chinese Taipei. Teammates Madison Chock and Evan Bates repeated as silver medalists, while defending champions Kaitlyn Weaver and Andrew Poje of Canada picked up the bronze. Shibutani and Shibutani delivered a very smooth free dance to “Fix You” by Coldplay, executing difficult elements almost effortlessly. The U.S. Champions collected a level four for their spectacular twizzles, lifts, spin and the diagonal footwork, and a level three for the circular steps. The siblings scored 108.76 points, a new personal best, and accumulated 181.62 points. The skaters were proud of how they performed both programs and are looking forward to the upcoming 2016 World Figure Skating Championships in Boston next month. Shibutani and Shibutani had a narrow lead over Weaver and Poje following the short dance. Both teams had performed very well, however, the higher technical score—all elements were a level four—gave the brother-and-sister team with their “Coppelia” program the edge over the Canadians that danced to “On the Blue Danube” and “Annenpolka” by Johann Strauss. Chock and Bates on the other hand, looked shaky in the short dance and finished only in fourth place in this segment. Nevertheless, the 2015 World silver medalists came back strong in their free dance set to Concerto No. 2 by Sergei Rachmaninov. Their lifts, twizzles and spin garnered a level four and the two step sequences were rated a level three. The team achieved a new personal best score with 107.59 points in the Free Dance and 174.64 overall. The reigning ISU Grand Prix Final silver medalists admitted they had a pretty rough short dance and felt they had nothing to lose in the free dance, so they made sure to enjoy every second of their program. Weaver and Poje looked somewhat shaky in their free dance set to “This Bitter Earth” and “Run,” especially Poje, who struggled with the twizzles and the rotational lift which was reflected in low levels for these elements. The other two lifts and the footwork were stronger, but overall, the Canadians lacked their usual flow. With 101.43 points they were ranked fourth in the free dance and dropped from second to third at 173.85 points. Poje explained that they the ice felt different than what they were used to and it threw them off a bit. USA’s Madison Hubbell and Zachary Donohue turned in a strong performance of their “Adagio for Strings” by Daft Punk and had a level four for all elements except for the circular footwork. They were third in the free dance, as they were in the short, but they still slipped to fourth overall at 172.29 points. The three-time US national bronze medalists feel that they are finally becoming comfortable and understanding who they are as a team. This event in general was an experience for the skaters, as well as the “tip of the iceberg,” and they welcomed it to part of their journey.